By Light Unseen Media, 9781935303060, 268pp. Montgomery Quinn is a millenia-old member of a race of metahumans called Olympians, dedicated to unending war against a power-mad cabal of vampires and rogue government mercenaries. In the modern-day twin cities of New Barrington and West Sussex on Borrego Bay, California, two newcomers are disrupting the balance of power. A mysterious woman known as Calianne is working to prevent her ex-lover Rajan Seddig Al'Meffistah from acquiring a talisman that will essentially make him a god, as Quinn is pulled into their centuries-long conflict. A renegade and outcast himself, Quinn maneuvers skillfully in a hidden underworld in which vampires are called Homo Draeconis or Moon-Chosen, non-supernatural products of parallel evolution with humans. World governments have entered into covert treaties with the Moon-Chosen to conceal their existence from the human population and prevent open warfare with these mutant nocturnal predators. But vampires and Olympians, sworn enemies, are not the only antagonists in an unending struggle for dominance. As Calianne and Rajan make their moves, other players take action from motives both selfish and noble, and few of them are what they appear to be on the surface. 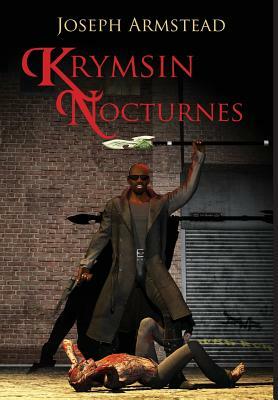 A blend of occult mystery and high-tech action-adventure set in an amoral, noirish world of mobsters, intelligence agents and vampires, Krymsin Nocturnes spins a tale that spans centuries, set in a richly drawn universe all too much like our own.